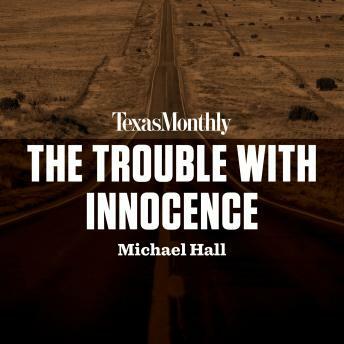 In partnership with Texas Monthly, Michael Hall's 'The Trouble with Innocence' is now available as an audio download, where the length and timeliness of a podcast meets the high-quality production of a full-length audio program. In 1978, a Texas jury found Kerry Max Cook guilty of the state's most brutal murder on record and sentenced him to death row. Cook swore that, no matter how long it took, he would prove his innocence, unearth the truth, and free himself from this sentence. Spanning decades, numerous lawyers, and meanwhile the physical and psychological abuse of prison, Cook would be prosecuted four times, only to have the veil of innocence narrowly evade him in the end. 'The Trouble with Innocence' opens with the hearing that would exonerate Cook nearly forty years after his original sentence. Exoneration, after all he had been through, was not enough for Cook, who then asked for his wrongful conviction back rather than live with this injustice. Michael Hall lays out Cook's grueling journey through the Texas justice and prison system in an attempt to answer: how could someone sabotage their own exoneration?